The wind was freezing cold the day this image was made. With no trees or anything else to block the wind, I wasn't long in photographing this time out. I was attracted to the blue sky dotted with small white clouds and how it contrasted well with the snow drifts produced by the raging wind. Despite the blue skies this image, it just seemed to be perfect for display in black and white. 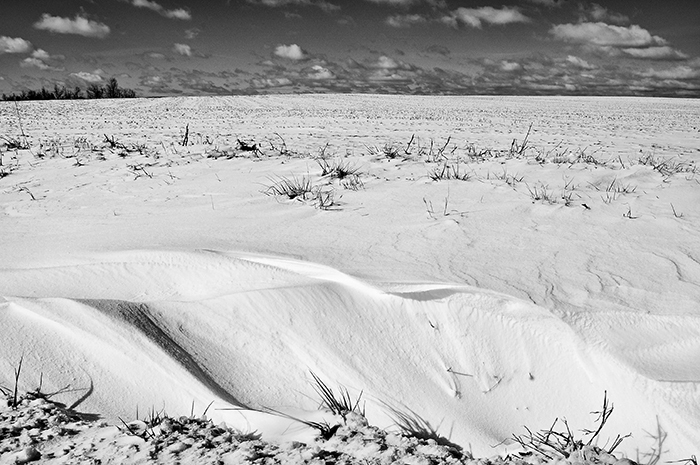 The texture of the wind-driven snow and openess of the landscape perfectly tell the story of place and time, hence the title of this image.